DERAIL REPLACEMENT BUS, Tranniesport For London, Wednesday (NTN) — An Associated Newspapers journalist dressed as a human was pushed under a train by everyone who had suffered the Daily Mail in the past two days. The incident started with shouting and a scuffle as people pushed forward to be the one to throw the abomination under a train. The benighted and unnatural creature was dressed in clothes normally worn by people, as opposed to the foetid rags issued to staff by Northcliffe Media, and had applied choking quantities of perfume to cover the stench of moral decay. Other reporters covering the incident hypothesised the misbegotten object was on its way to a “party” at 6:37pm. It was initially reported that an actual person had died, but fortunately the media was able to make it as clear as possible what a disgusting freak the “trans-human” so-called victim was. Prosecutors had tried to ban the publication of the victim’s name, saying it would cause a substantial risk of serious prejudice to any trial. Thankfully, British journalism is above any such petty considerations. 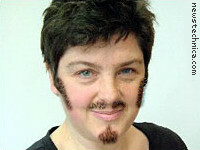 Police are seeking Julie Bindel to assist with their inquiries.